I grew up on kielbasa, unbeknown to me. In my house, kielbasa was served with mustard and a side of Velveeta mac and cheese (bleck!). My mom would even remove the skin of the kielbasa for me…lord only knows why. Bless her heart. 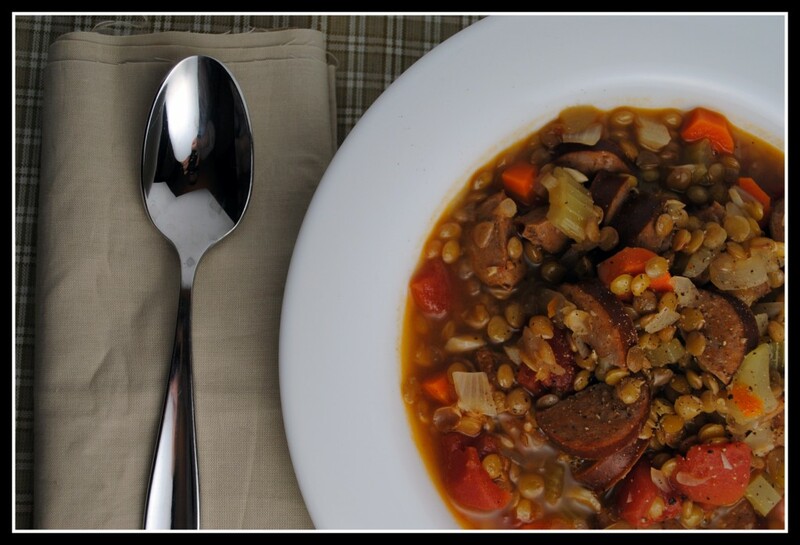 In this dish, turkey kielbasa is flavored with garlic and served up with hearty, healthy lentils and plenty of vegetables to start the new year right. After being raved about online and the 8 cloves of garlic the recipe called for, I could only assume we would enjoy this recipe. Though not the traditional black-eyed peas on this New Years Day, lentils are a close relative and something I would like to use more often in my kitchen. 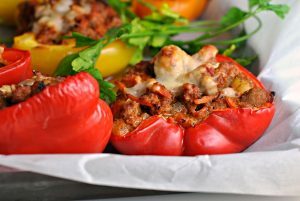 A low-calorie, filling, and low-cost dish with lots of flavor to start 2012 off right. Here ya go! Heat oil in a large pot, then add kielbasa. Cook until brown and then transfer to a plate. Add onion, celery, and carrots to pot and cook until golden. Add garlic and cook another minute. Add water, broth, tomatoes and lentils to pot and bring to boil. 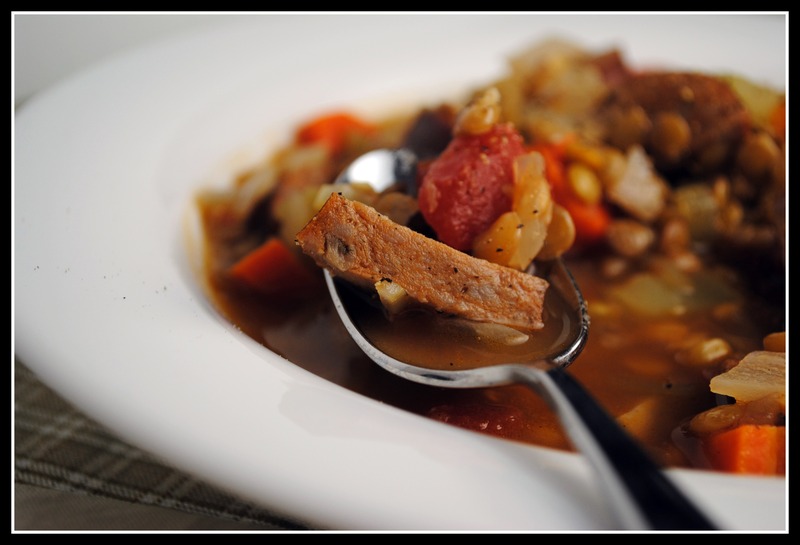 Reduce to medium-low and cook uncovered for about 40 minutes, or until lentils are tender. Stir in kielbasa and heat through. Serve. Yield: 10 servings. Result: This was a great dish packed with flavor and fiber. Lentils are inexpensive and loaded with nutrition. If you love garlic or kielbasa, this dish is perfect for you. Mr. Prevention gave this one a thumbs up, too…and that I wasn’t expecting! Enjoy! Money Matters: The kielbasa is the most expensive ingredient, but I was able to find organic, nitrate-free turkey kielbasa for $3.99 for 12 ounces at Whole Foods ($0.33/ounce). I got 8 large onions for $3.99 at Cost Co ($0.50 each), and 1 bunch of celery (about 8 stalks) for $0.99. One pound of lentils is $1.19 at my Kroger and broth is on sale all the time for $0.60/can. The total cost of the recipe comes in at $14.o7 and the cost per serving, $1.41. Okay, I think I definitely will make the buffalo chicken chowder – yum! Happy New Year Nicole! I am headed to Forest Park today to celebrate Christmas with my mom and my sisters family – should be fun! That is so funny – we used to eat Kielbasa and Kraft Mac and cheese all the time. To this day, I cannot eat kielbasa or even think about it. Too traumatized from my youth! I think I’m a kielbasa virgin. I’m not sure…the garlic would probably kill me though! I hope you had a nice new year. We’ll have to get together soon! This looks excellent! It looks so hearty! YUM! 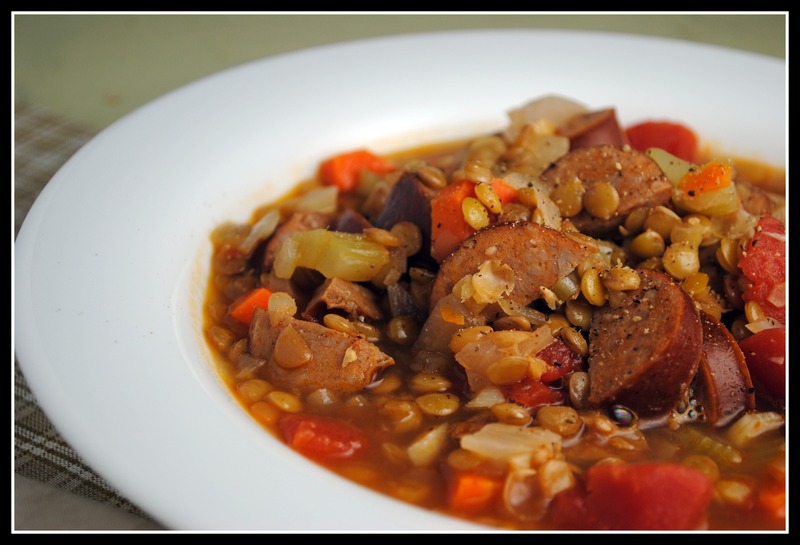 Lentils and sausage is such a great combo! Happy 2012, Nicole!!! Very, very Happy New Year Nicole. To you, Mr. P, Lily and all of your family. I wish all of you a healthy, happy and loving 2012. Looks like you found a nice new years recipe. Have a good week! Can’t believe you are already back to teaching. I have 2 online courses starting this week, but my other one (and the one I am taking) start back up after MLK day. Good luck in the new semester! I’m glad you enjoyed it – thank you! Unfortunately, where I live at least, that turkey kielbasa at Whole Foods has gotten up to over $6 per 12 oz :/ But I’d already gotten all the other ingredients for super cheap at the Asian grocery store so I bit the bullet on the kielbasa–it’s still under $3/serving. This looks delicious. 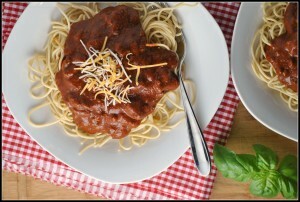 Do you think this could be done in the crockpot and just left to cook all day?